IRVINE, CA--(Marketwire - December 1, 2008) - Composite Technology Corporation (CTC) (OTCBB: CPTC) announced today that its subsidiary, DeWind, has completed the mechanical commissioning of the 2 megawatt D8.2 wind turbine sold to Hilltop Power LLC and erected in Pipestone County, Minnesota. All mechanical commissioning is complete and the turbine will complete electrical commissioning and synchronization with the grid before year end once the local power grid connection comes on line. Power is being sold to Xcel Energy on a local distribution line for use by local customers. David Norgaard, Owner, and Wayne Hesse of Southwest Wind Consulting, who are the developers for the project, stated, "We are very pleased with the installation and believe the D8.2 is an excellent product that is being produced in the U.S. We look forward to working with DeWind on future Southwest Wind projects." Benton Wilcoxon, CEO of CTC stated, "We are pleased to start the commercial deployment of our D8.2 turbine in the U.S. Our Sweetwater, Texas, turbine installation was the first D8.2 commissioned in the U.S., initially as a demonstration turbine followed by a sale of the turbine to the Texas State Technical College. The Hilltop turbine is the first strictly commercial deployment in the U.S., and begins a new era for DeWind. Our previous D8.2 installations in Germany and Argentina have demonstrated excellent ability to synchronize with the local grid and provide clean power with built in capability for reactive power control to help stabilize the grid. 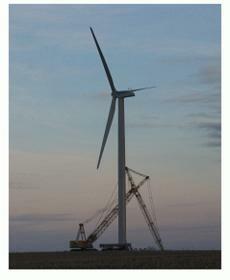 We expect this turbine will continue to prove the value of our DeWind turbine." This application is a community power project, where the DeWind turbine has found favor. The community of Willmar, Minnesota has also chosen the D8.2 for its community power application. Prototype versions of the DeWind D8.2 have already logged over 8760 operating hours of clean power delivery in Germany, Argentina and the U.S. The D8.2 turbine for Hilltop was assembled in Round Rock, Texas and incorporates the Voith WinDrive®, a hydrodynamic torque converter which allows constant output speed to the synchronous generator with high voltage output that synchronizes directly with the grid without power electronics. "We are very happy to be on track to bring the DeWind turbine on line. This project has been eagerly anticipated for many months and we will soon be ready to generate commercial power for the community," stated Evan Johnson, Manager of Hilltop Power LLC and Mechanical Engineering grad from the University of Minnesota. "I'm also very impressed with the DeWind design and construction." Hilltop Power LLC is made up of members of Hilltop Farm Corp., of Maple Plain, Minnesota. Funding for the Hilltop power project is in part by a grant from Xcel Energy Renewable Development Fund with financing through Agstar Financial. electronics. The first 60Hz D8.2 is now operating at Sweetwater, Texas. Co., in Texas for our North and South American customers. DeWind D8.2 Turbine at Hilltop, Minn.